A crime this didn't win. Awesome style and code. Great demo with superb graphics and soundtrack, and many stunning screens! this was so ossom on the stream! Lots of nice graphics and some neat effects. Not too fond of the music though and pacing could be better. Petscii infinite zoom. And that scroller in the screenshot is cool in front of the background and solid. Wait, this did NOT win?! This Demo is a Masterpiece! I have absolutely no clue how you did the scroller in the screenshot! Now that i´ve seen this i wonder what Shape is up to in the Future...can it get even better? rulez added on the 2017-02-12 13:33:14 by ɧ4ɾɗվ. Excellent! Keep it up guys, one of my favourites from the compo. The graphics really carry this one. Well deserved 2nd place. Very nice. rulez added on the 2017-02-12 15:34:25 by w00t! shape combines excellent gfx and music with a tight flow that never gets boring, well done! what happened to wisdom btw? The cubescape effect looks ace.. And some of the effects are "wtf"! Completely NOT what StingRay said. Pacing could be better?! Good joke, Sir ;) Considering what kind of data guys have to load (and loader works flawless), it's tight as hell. And quite unnecessary and useless comment, Sir! When I say pacing could be better I mean exactly that and don't care about how much data has to be loaded. Absolutely gorgeous!!! and, oh my, these GFX!!! Is the flip disk part an allusion to this? Amazing, absolutely amazing graphics and some very cool and original ideas for effects. I wish it was just a bit less cryptic and made just a little bit more sense, because the progression is clearly there and some of the scenes are very evocative. Or maybe I just have no clue. Lovely work and I am looking forward for more in this vein. Archmage graphics extravaganza! And nice routines as well, scroller in screenshot is *insane*! Really superb graphics! Especially the pics where the guy is crushing the chemical tube.And this psychedelic theme runs all the way throughout. Rare to see such consistency. For the effects I thought the many "burning" transitions were really neat. The cubescape looked smooth and those petsci infinite zoomers look awesome. Think its the first time I have seen this effect. It looks like kind of c64 vector graphics technique. Lots of people say the twisting scroller is the 'impossibru' effect. Would be cool with some background why in particular that one? Is it because there are too many pixels to plot considering the framerate and the background is complex? If it was amiga it would be some kind of table effect thing, but probably not how it's done here. 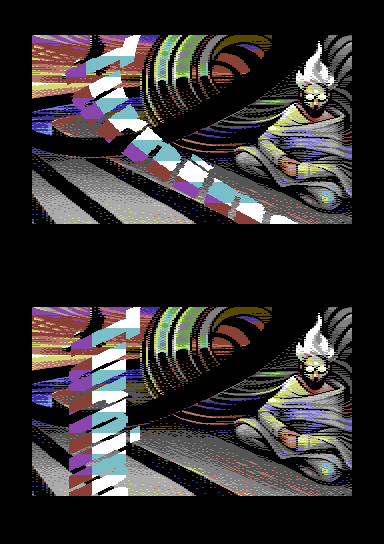 One of the great C64 demos of all time. Lots of people say the twisting scroller is the 'impossibru' effect. Would be cool with some background why in particular that one? Is it because there are too many pixels to plot considering the framerate and the background is complex? In many parts it feels like watching a slidehow and the effects are just there to build up the next awesome picture. Really great demo - my personal winner at the compo. I am really happy that Archmage was able to carry the concept from start to goal without compromises. Graphically heavy - yes, and what a ride! It's one of those prods that erases the lines between demo, slideshow and art. Doing anything with 10k pixels when you have less than 20000 cycles per frame would be hard. So straight up per-pixel LUT is out I think. Have to be something smarter! Totally awesome graphics in here... and I love plain Hiresmode with clever farbclashes ;) ASCIIZoomer after Turn Disc party also rocked hard! Should have won. Archmage obliterates all. Others may produce a higher number of photorealistic images, but very few can compete with his sheer mastery of emotion, and command of the storyboard. Excellent soundtrack as well. Effect wise it's a bit of a mixed bag as I remember it from the compo, but the high points (such as that scroller) were really, really high. loaderror: Check out "Sharp" by Fairlight and Instinct and "Effluvium" by ChristopherJam for char-based infinite zoomers. insane amount and quality of artwork in this one. wow! Best C64 production i have watched in a while. A great amount of amazing graphics, imaginative ideas, very moody and stylish parts. The music wasn't my cup of tea and some effects are not on par with the rest, but that's minor complaints while being overwhelmed by the visual side of the demo. My favorite from the compo. The graphics are insanely well done! Wow, the graphics and design are so amazing! Archmage rules. nice demo... just wondering why this did not win? Good work. Despite the participation of two gfx artists in this project (with different drawing style) the demo is very consistent (which rarely happens in such case). Nice soundtrack, mood and flow. It is a good demo. Superb demo with a real good flow. Great music, good effects and nice graphics in a good combination. Beyond just "good graphics" the greatness of this demo goes much much further. It's not that the pixelling is technically well done—which it is—but they are very consistent and convey emotion the way very few demos manage. Both of the top two could be said to deserve to win, but this just went way beyond my expectations. One of the most profound demos on this platform especially. i was blown away by this at the party! infinite zoomers being my favourite parts, but also a 3d blocks with the floating guy did top the whole "this is #@$@# amazing!" opinion for me. respect for making it, absolute winner of the compo for me. What Slayer said.. and Bonefish to..
Amazing ! Shape is one of my favourite C64 groups since artillery, I think this is their best prod as code is at the level of graphics, design and music ! 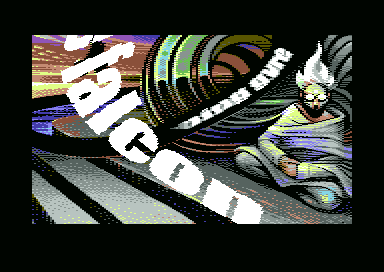 Clearly one of the best C64 demo ever done for me :-). Really stunning visuals and theming. The petscii zoomer was a great touch too. missed the thumb on this, absolutely lovely work! Not bad and very nice, but too lengthy at times. Ohhhh, I love this demo so much. Keep on watching it during this year over and over again. Story, gfx, music - everything is so good! Missing thumb. My fav' C64 demo in 2017.
page created in 0.019562 seconds with 15 queries.